Hey guy's so i've gathered a heap of info over the past week or two and have come up with a detailed parts list and overview of what is needed for a conversion, I tried my best to get all the info I could. Moderators Please Make This A Sticky, Please. - Oil and water lines to run to turbo, these are essential to your new turbo to prevent it exploding! If you're building an RB30ET and use a VL series 1 engine block, you need to put a T-piece in the oil pressure sender hole in the block and use one of those for the turbo oil feed line. This should ONLY be done after you have upgraded your brakes to turbo spec! N/A brakes and a Turbo DO NOT MIX, they could choose to FAIL at the worse possible time. This is for everyone's safety not just your own. If you obey the speed limits your brakes won't fail (from normal driving). It's when you start to increase the boost and reach higher speeds that the standard brakes hold their heat just that little bit longer, and reach a less effective state sooner. Having said that, it's advisable to have them serviced thoroughly as a bare minimum, if not upgraded. i.e. Machined rotors, New pads, Better brake fluid etc. A decent set of tires is advised when adding a turbo, Safety shouldn't be budgeted for as part of the conversion. Brakes are only as good as the tires. Don't be stingy and get retreads either, or only buy for the rear. All 4 wheels should have new tread on them. a8 designates rb30et, a6 designates rb30e. It will only be on the number at the RIGHT HAND FRONG of the motor, the number at the left hand rear will always end in A. The Turbo Used is a Nissan Garrett T3, which is water-cooled; it has an internal Wastegate, which is set to approx. 6 PSI. Safe boost past this level is around 12-14psi, with a front mount intercooler and 3" turbo back exhaust. The ETs run 7.8:1, Es run 9.0:1. Turbo motors generally have lower compression than their naturally aspirated counterparts to deter knocking. There is a chance of detonation (and not detonation as in "blow up", like i've mentioned a few times) is increased on an NA conversion motor. Fuel maps released on the standard ET ECUs were written on standard RON91 fuel, which what was available in '86-88'. When you move onto an aftermarket ECU (e.g. Haltech, Vipec etc) and get tunes performed on a dyno, then you should discuss fuel with your tuner and have it tuned accordingly. Having said that, if you can afford the premium stuff it is preferable, if not 95 octane should be considered as a minimum, which would be fine. The Turbo camshaft has got less overlap than the non-turbo one both are useable. When it detects pinging, it will retard the timing 5 degrees, if you are running a turbo computer there is a guide on installing one somewhere on calaisturbo. The MF5 is a very weak box (I broke 2 with a very stock N/A) they won’t handle too much, if you drive like a granny, it should last 6 months or so, there are less syncros in an MF5 which could can lead to some damage when changing gears hard ("slamming" in into gear); however gentle shifting can see an MF5 hold power (reportedly) up until around 220rwkw, where you can start to see teeth being warped and pushed off the gears. Same for the RB20DET boxes, however they have dual syncros and are generally better option when on a budget. 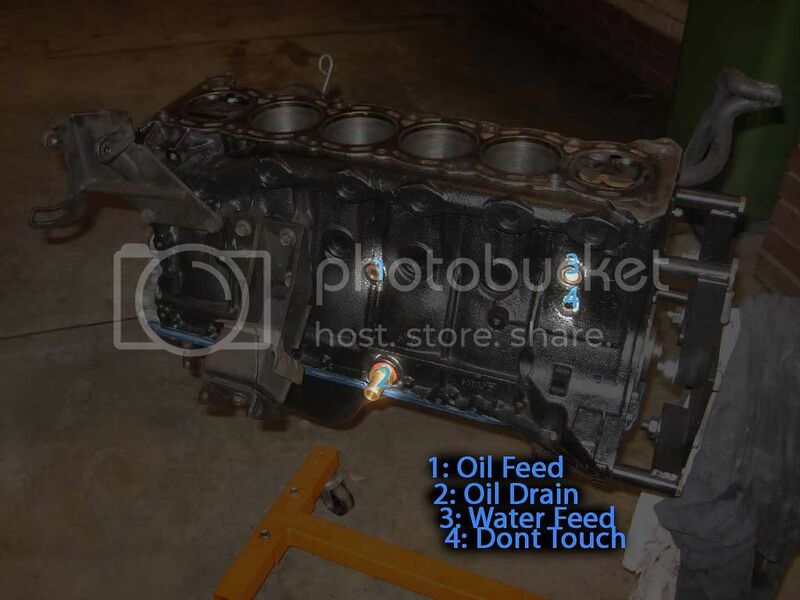 The Standard Holden Manifold can used, be sure to check if it is cracked, also it would be a good idea if you replace the studs, by spraying with WD40 or similar. The Holden one is fine; you can get a larger one. The standard one is used, although you can get a larger one made up. It has got one fitting on the side, which is a Vacuum hose that goes onto the AAC valve at the rear of the intake plenum. The top of the injectors should be BROWN coloured, you MUST use Turbo injectors with a Turbo Computer, you CANNOT mix and match, if you use NON TURBO INJECTORS the motor will not get enough fuel, and most likely wont last over a week. You NEED a turbo computer (accept this as a minimum) in order to run the turbo injectors, an Auto computer will run both manual and auto cars, but a manual computer will not run an auto car. If no stickers on cover, Open the ecu, a turbo ecu will have a second green computer board on it for the knock sensor. the water return goes to a heater hose on the other side of the engine with a T piece. The radiators in ETs were apparently 3 core, but as you fiddle with the boost and timing, the engine bay will become more and more heat soaked, resulting in damage (melted fuseboxes, overheating, etc). So the cooling system should be in good condition, or serviced thoroughly before the conversion. So guys and girls, Thats my write-up if you think I should add anything else please let me know, this took me a while to write so hope you's like it. I believe the melted fusebox problem may be caused by the highbeams drawing too much current not by a heat soaked engine bay. you could fix this by running those wires on their own outside of the fuse box with glass fuses or something similar. Silly question but where is the water drain? The water return is fed around the back of the engine and then back into the cooling system. The most common place is to cut the hose coming out of the heater feed (it's under the front of the intake manifold), adding a t-piece and plumping the return from the turbo in there. Last edited by CJW; 22-08-13 at 19:18. Could someone post a photo outlining this? I'm too confused as to where the water return line runs. I've heard of running it into the heater hose? I've done heaps of searching and I still can't confidently say I know where to plumb the return coolant. Here's a sketchy pic courtesy of google, it should show you all you need to know though. The red arrow shows the hose you need cut, add a t-piece and then connect the turbo return hose. [QUOTE=CJW;3026603]Here's a sketchy pic courtesy of google, it should show you all you need to know though. The red arrow shows the hose you need cut, add a t-piece and then connect the turbo return hose. I'm more confident now with where to T-piece into, from what I originally thought I was supposed to do was tap into the heater core water lines.. That would've been very silly. I've talked to Abe from Havoc Fabrications and he shed some more light onto where to run the return water line, next step is getting the hoses .